Did you know Kendall and Kylie Jenner have a clothing line together? Did you know it's also very, very kickass? A nod to the simple but structured styles we see from our favorite Australian designers, the Kendall+Kylie line really blew me away. 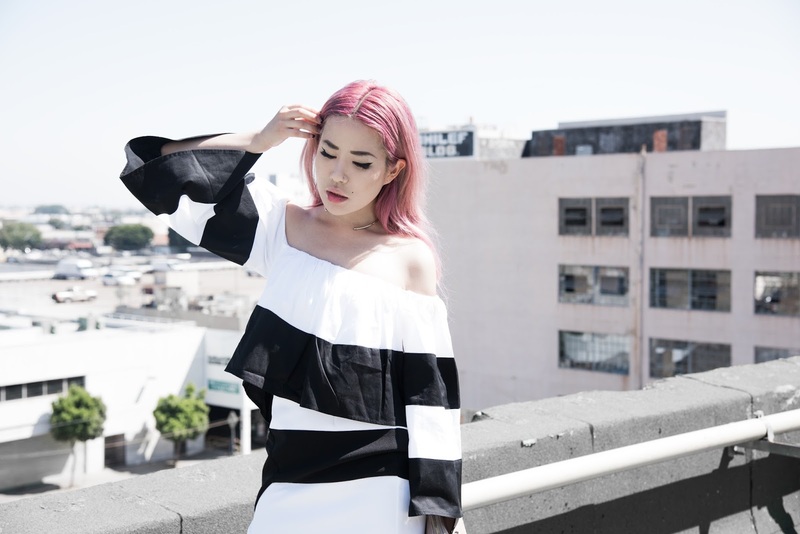 The set I'm wearing in this post is perfect for when I want to dress to the nines--black & white, it balances a loose, billowy top with a bodycon skirt (that has a zippered side slit!). I kept my usual leather off my neck and torso and substituted it on my lower half instead. I adore a great pair of thigh high leather boots. Not the most functional for summer, but damn, they look good. I've curated a shopping guide with some of my favorite picks (unsurprisingly, mostly black) at the bottom of this post! I adore this minimally graphic look! Stunning on you! That such a cool off the shoulder top! Yes! Their line is SO GOOD. Way better than any other Kardashian clothing lines. The pieces actually look like things that the girls wear. Love how you styled it! Really suits you! SO Fashionable look,Beautiful dress,hair style. Really cool!!! Love this back-n-white style. Hope you create more and more collections like this! I intend to to buy this Lejre midi Skirt from Urge2buy. Can you give me your idea about this item? Thank you so much.